My most recent read, (aside from rereading the last 2 books of the Harry Potter Series) is The Unlikely Disciple by Kevin Roose. 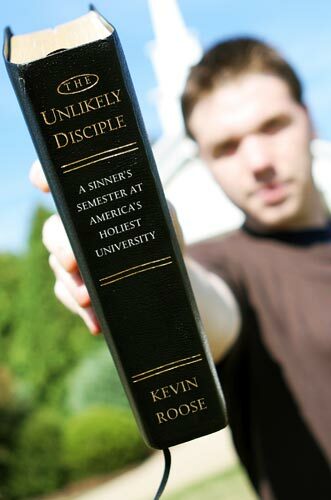 This is an intriguing memoir of a young freshman at Brown University who, in 2007, after a visit to Thomas Road Baptist Church, decided to go “undercover” at Liberty University for what he describes as “A Sinner’s Semester at America’s Holiest University.” Talk about polar opposites in higher education! Well, as a graduate of Union University, I am not sure that Evangelical universities have ever been rated on their level of “holiness;” however it is because I am the product of a conservative, Southern Baptist, evangelical university that I decided to give this book a look. And I am glad I did. Roose is very fair in his portrayal of Liberty University. As I recently shared with a friend who is a graduate, there may be times that a Liberty Alum may feel a bit ruffled at his context, but give it time. Stick it out to the end of the story before passing judgment entirely because while Kevin gives a secular “outsider’s” perspective on what we loved to call “the Christian bubble” that, like it or not, does often occur at Christian universities, his observations and his behavior should challenge Believers to consider several things. The first challenge is that you can’t judge a book by its cover (ha, ha no pun intended). Before his semester at Liberty, Roose did a bit of training and reconnaissance work to prepare for this time there, including spending quality time with his “one Evangelical friend,” a “sweet curly haired brunette” with a “church deacon dad and two decades of Sunday School under her belt” which Roose describes as “Real Christian Street Cred.” While this didn’t fully prepare him for the front lines of Evangelical Conservatism, it did give him enough to blend in. One of the most surprising elements of the story to me is that no one at Liberty seemed to suspect him for an impostor. He played the game. He “went through the motions.” He sang in the choir at Thomas Road, he went to every chapel service (three times a week! ), he attended prayer groups and Bible studies, and everyone around him accepted him as a fellow Evangelical believer when he was not. There is no doubt that he raised a few eyebrows at times, but there are always the “envelope pushers” at schools like Liberty and I can imagine that Roose was written off into that category by his purist peers. The second is you can’t judge a book by its cover. Wait didn’t I just say that? Yes I did, but this time the moral of the story is directed to the author. Roose came to Liberty with hideous preconceived notions about what he would discover about the culture there. He even says that he expected the students to all be political conservatives in training, future far-right lobbyists, think-tanker, and politicos in the making and I believe he was a tiny bit disappointed that he didn’t find any fundamentalist training camps on campus. However, what I love the most about this book, aside from Roose’s wit (he is quite funny), is the undertones of redemption that run through every chapter. I love that his preconceived notions were debunked, quickly, upon arriving on campus and really getting to know the people there. I love that he had some very close encounters with the real live Holy Spirit, even though I doubt he would admit that, but some of the experiences he describes in the book, Believers will recognize as the Holy Spirit. It’s also important to note that Roose was on campus at Liberty in a very trying semester for the University. It’s the same semester that Dr. Falwell passed away and the same semester as the near by Virginia Tech shootings. I personally enjoyed reading Roose’s insights as to what it was like being a student at Liberty during those trying circumstances. Without giving too much else away, I want to give this memoir two enthusiastic thumbs up. Its a fun, quick read that even my Liberty University Masters Candidate husband on break for the summer read it in 48 hours. And if you attended a Christian, especially Evangelical Christian university, I promise you will appreciate this story and find yourself laughing out loud despite yourself. And finally, not to stir up any commotion, but if Kevin Roose never accepts Jesus Christ as his personal Lord and Savior, the age old debate of Free Will verses Election will have some explaining to do because 1. if the Holy Spirit is irresistable, how on earth could Roose deny Him? or 2. Maybe election is real and Roose is not of the elect or else he would not be able to resist the Spirit? or 3. Maybe Roose didn’t resist the Spirit. Maybe he “believes in his heart” but he has not yet “confessed with his mouth”? and 4. if he doesn’t put his faith in Christ then how do we make sense of the oft quoted Isaiah 55 verse, “God’s word does not return void”? I am not coming down one way or the other on any of the questions I pose above, but since Roose put himself out there like he did, we can’t be faulted for weighing his experiences against the things we have been taught and after reading the book I have a lot of open ended questions with no one right answer. This would be a fascinating read for a book club discussion. In any event, I know the relationships he developed with believers at Liberty are real, and I know the students who knew him are sincere. I pray he has the courage to be true to himself, wherever he lands on the evangelical spectrum, and I believe he will. Next Post Vote For My Friend’s Twins in Show us the COW Contest @ Chick-fil-a!! I also hope he finds Christ. Particularly I hope he finds Christ through the roman catholic church that was founded by Christ. I think this is a great resource; I couldn’t put it down once I started. It’s refreshing for us to see ourselves as others see us. I notice that a few Christian bookstores are carrying this item, too.